Dealspotr Review: Does It Really Save You Money and Earn Rewards? When you have a budget and need to save money, where do you turn? Do you have a favorite app to use? Visit deal websites? Coupon? 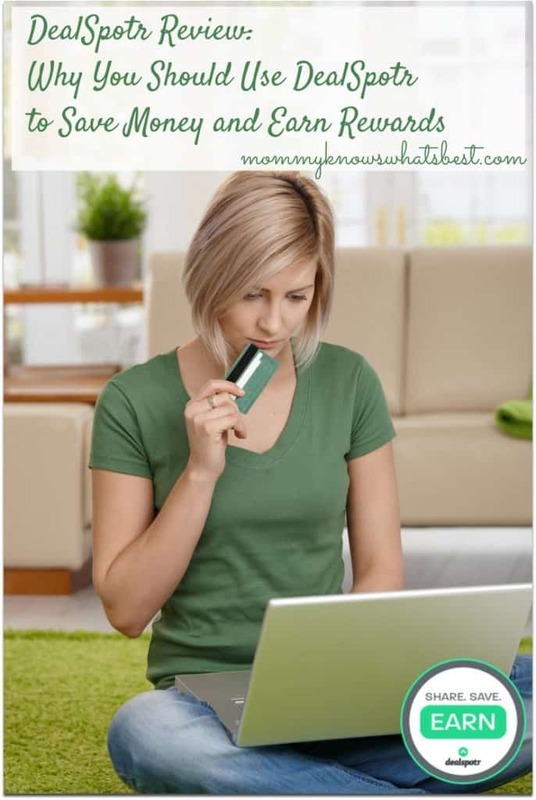 As a mom with four kids and a tight budget, I spend a lot of time finding ways to save money. I am constantly scouring for deals online or by using my money saving apps. Many times, I score great deals, but only some of those times I earn rewards back from my shopping activities. I admit that I was skeptical at first since I have already tried other deal websites but have not been successful in both saving money and earning rewards, but I gave it a chance any way. Dealspotr is a free, real-time coupon and deal sharing platform where users validate and invalidate deals daily. 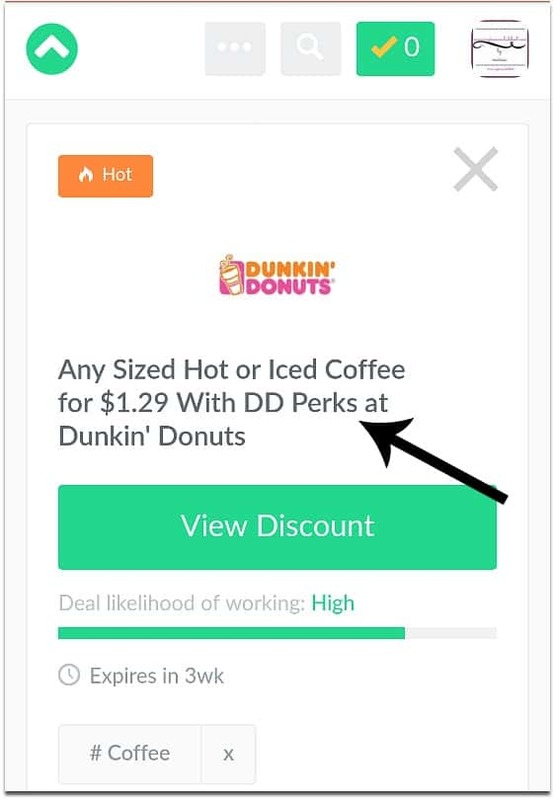 Unlike other deal saving sites, Dealspotr lets you know the likelihood of a deal working or not based on expiration dates and whether users were successful in using the coupon or deal. You can see right away if you are going to save money thanks to the community of users checking deals constantly. Since Dealspotr is community based, anyone can join and add or validate codes, but that doesn’t mean quality is lacking. In fact, since the community is given incentive (rewards) to add or validate deals or coupons, you can ensure that the deals and coupons you find are most likely going to work. 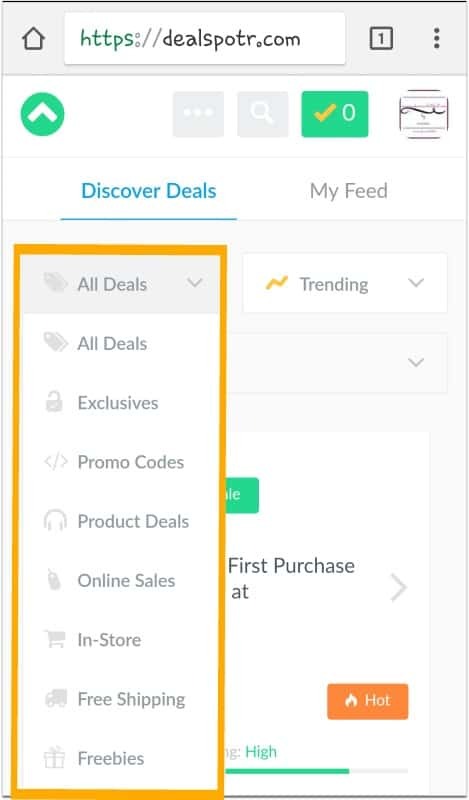 Dealspotr is also very organized. 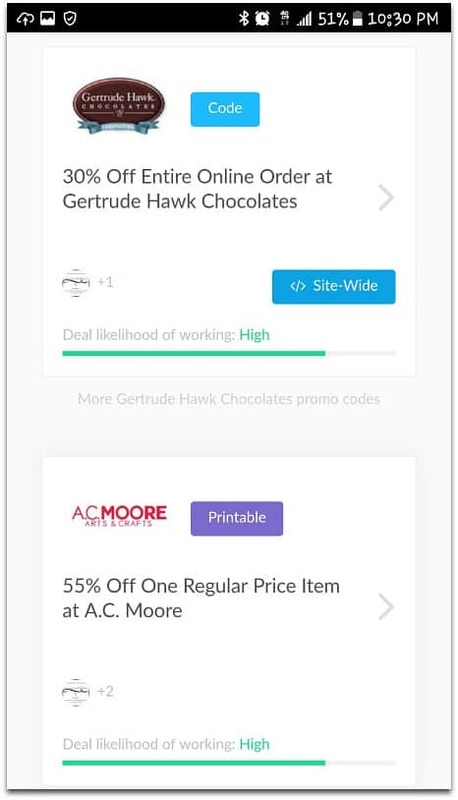 Deals and coupons can be sorted by interest, type, or store. You can even just use the search function to find what you are looking for. It’s easy to save money using Dealspotr. Once you have joined for free, you’ll be encouraged to add your interests and favorite stores. From there, your Feed will be developed. 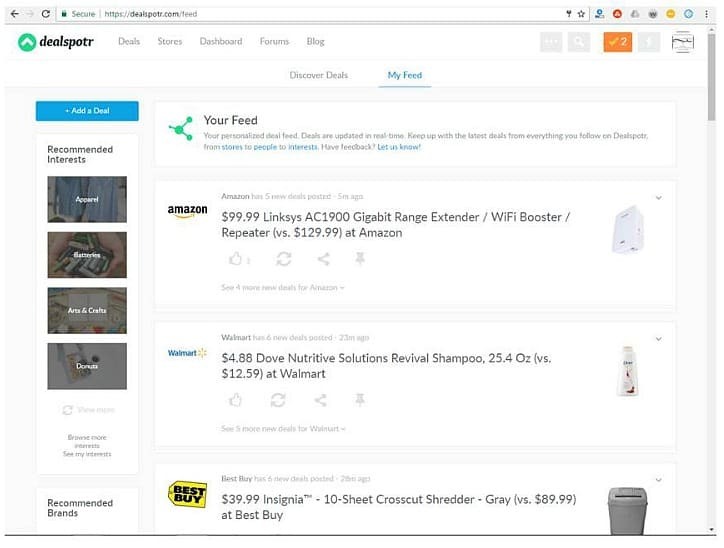 Your feed is personalized and will be updated in real time daily, so you will constantly see new deals and coupons for your favorite interests or stores added and you won’t need to go looking for them. You can also sort for deals in the menus. Find the Latest, Trending, Hot, or On Fire Deals in any category (exclusives, promo codes, product deals, etc). You can also browse deals by store or interest. Choose what kind of deal you are searching for. You click on the title of the deal and follow the instructions. You may be given a physical coupon to print or a promo code to use online, or be given a link that takes you directly to an online deal. When you’re done and have used the tips to get a deal, you return to Dealspotr to let them know if the deal worked. That tells anyone else who may want to use the same deal whether or not the deal is valid. If you saved money, you are given the option to enter how much you saved. You can also share the savings on social media channels so that your friends and family can save money too. Clicking on this image will take you to the details of this deal on Dealspotr. Of course, there may be times when a deal doesn’t work. In that case, you let the system know by clicking ‘No’ if the deal doesn’t work, and explain what happens. That’s it! If you’re just looking to save money, it’s quite simple to use Dealspotr. Of course, rewards do make things a tad sweeter. For every 10,000 points you earn, you can get a $10 Amazon gift card. So, if you have 20,000 points, you can redeem them for a $20 Amazon gift card. and whether your deal is determined valid by the community. I personally have seen points as low as 2 and as high as 150+. To validate a deal, it is not necessary to purchase a product. You just have to prove that a deal/promo code works and is accurate, screenshot the website, and that’s it! and a screenshot of the deal working. Another way to earn rewards is from referring members. When you refer new members, you also earn 10% of the points they earn for the lifetime of their membership (20% for influencers, see more about that below!). They’ll get 5,000 points for joining through you, and when they refer new people, they can earn referral points too! Okay, so does Dealspotr really work? I told you how to use it, but this is what I think about it. 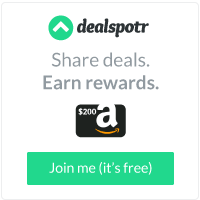 I have been a member of Dealspotr since January 2017. At first, I joined, but didn’t know what to do with it, so I let my account just sit. It wasn’t until the end of February that I looked at my account again. I was actually surprised at how easy it was to use the site once I browsed around. Probably the easiest thing to do was to complete my new user checklist, which basically gives you a good idea of how to use the site. From then on, I started using my Daily Checklist to earn points every day. When I’m having my alone time with my coffee in the morning, I go over my checklist to see what I need to do to earn a bonus 200 points. At max, it takes me 15 minutes to go through and complete the whole checklist (that means I can do it all before the kiddos even wake up in the morning!). In 5 days, I can earn 1,000 points just from doing the checklist, not counting all of the points I earn from the deals I post or validate or my referrals! The easiest things for me to do is to just validate/invalidate deals, like deals I find useful, and share deals I want my followers to know about. I also find it super easy to use Dealspotr from my smartphone rather than on the computer, just for the sake of being able to take screenshots and upload them easily. What I tend to find difficult is actually finding and posting a deal that someone hasn’t already posted. It seems that many of the users add deals as soon as they see them (which is awesome if you’re on the site to save money), which can limit me from getting more points for finding the deals first. As soon as those emails start filling my inbox in the morning, I browse through them to see what great deals I can share. 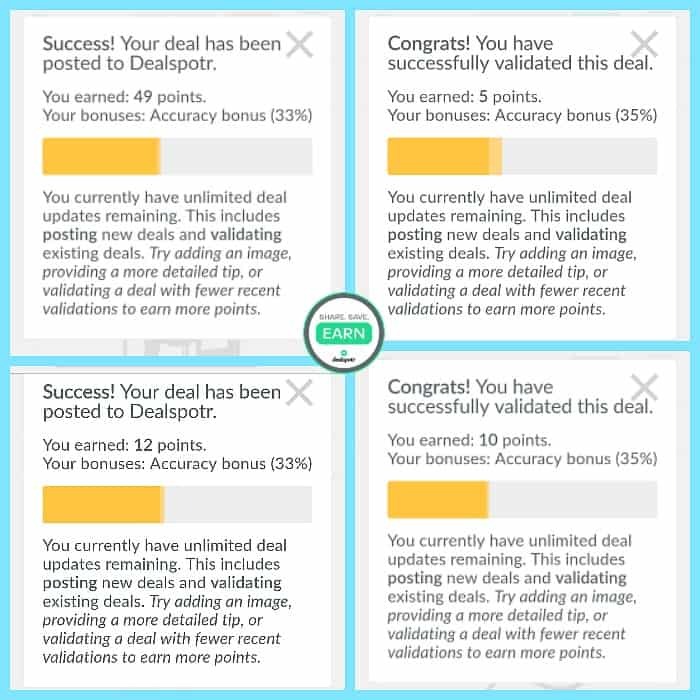 I find out as much as I can and go right to Dealspotr to see if I am the first to post the deal. I also post deals throughout the day, especially if a new deal shows up on my Facebook feed. Click on this image to go to my profile on Dealspotr. In March alone I earned enough points for two $20 Amazon gift cards. Soon I’ll be able to get another gift card! Do I like Dealspotr? Yes! Would I recommend it? Yes! 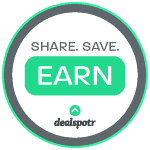 If you have 10-15 minutes a day, you can use Dealspotr with ease to both save money and earn rewards. Read my review with DealSpotr to learn more about me! When you first join using my referral link (blogger? Look below), you can earn your first 5,000 points. From there, you can earn more points by completing your new member checklist, your daily checklist, and any additional deals you post/validate. Let me know in a comment below when you join so I can follow you! Need more info? Let me know what I can add to my Dealspotr review! Are You a Blogger or an Influencer and Want to Join Dealspotr? If you are a blogger or influencer looking for another way to earn money, you can join Dealspotr as an influencer. (To join, you need an access code. 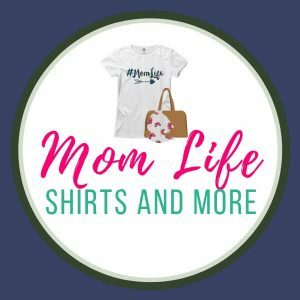 Please email me at mommyknowswhatsbest@gmail.com with your blog info and I can send you one!) 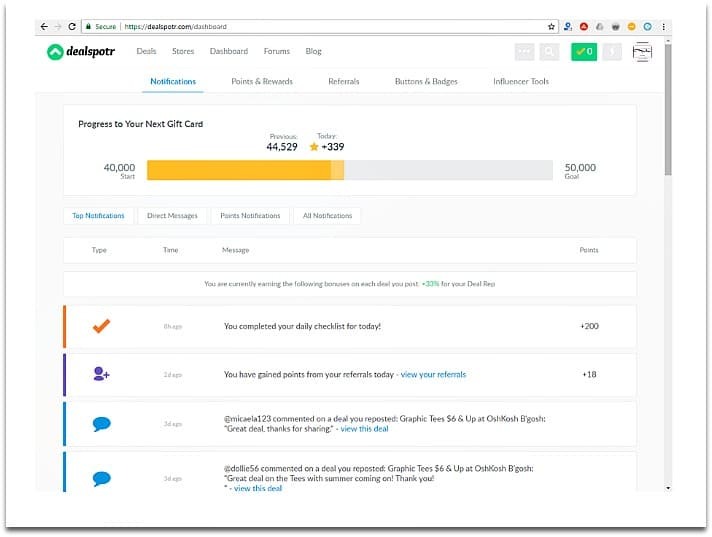 Influencers get access to more opportunities to earn with Dealspotr, plus you can share all of the deals you find directly with your fans and followers! 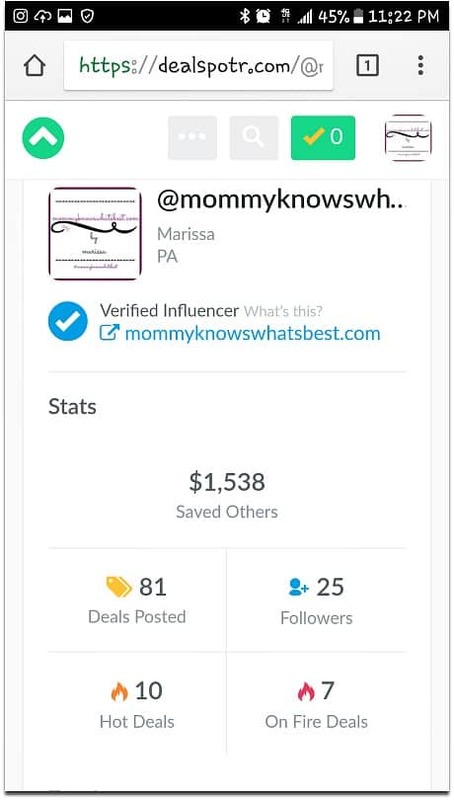 I was compensated for my Dealspotr Review, on behalf of Dealspotr, where I am an influencer member. All words and opinions are mine. Referral links are included in this post. Thanks for the article, I use dealspotr all the time and it is great. I’m glad you’re a fan of Dealspotr too! I’ve heard of Dealspotr, but I had no idea what it really was about. This is so cool, and a very good post with so much info – I want to try it!! You can still use it on the computer. I just prefer to complete the task on my phone. I have yet to try this one but I love to save money with apps. However many are so confusing and pay out so little it is soon cast aside.